No other artist is more associated with the term Modern Art than Pablo Picasso. He created thousands of paintings, prints, sculptures and ceramics during a time span of about 75 years. For many, Picasso is the greatest art genius of the twentieth century. For others he is a gifted charlatan. Undisputed is the fact that he influenced and dominated the art of the twentieth century like no other modern artist. 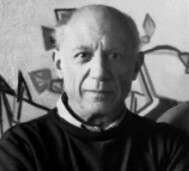 Pablo Picasso was born on October 25, 1881 in Malaga, Spain, as the son of an art and drawing teacher. He was a brilliant student. He passed the entrance examination for the Barcelona School of Fine Arts at the age of 14 in just one day and was allowed to skip the first two classes. According to one of many legends about the artist’s life, his father, recognizing the extraordinary talent of his son, gave him his brushes and palette and vowed to paint never again in his life. During his lifetime, the artist went through different periods of characteristic painting styles. The Blue Period of Picasso lasted from about 1900 to 1904. It is characterized by the use of different shades of blue underlining the melancholic style of his subjects – people from the grim side of life with thin, half-starved bodies. His painting style during these years is masterly and convinces even those who reject his later modern style. During Picasso’s Rose Period from about 1905 to 1906, his style moved away from the Blue Period to a friendly pink tone with subjects taken from the world of the circus. After several travels to Paris, the artist moved permanently to the “capital of arts” in 1904. There he met all the other famous artists like Henri Matisse, Joan Miro and George Braques. He became a great admirer of Henri Matisse and developed a life-long friendship with the master of French Fauvism. Inspired by the works of Paul Cezanne, he developed together with George Braque and Juan Gris developed the Cubist style. In Cubism, subjects are reduced to basic geometrical shapes. In a later version of Cubism, called synthetic cubism, several views of an object or a person are shown simultaneously from a different perspective in one picture. In 1937 the artist created his landmark painting Guernica, a protest against the barbaric air raid against a Basque village during the Spanish Civil War. Picasso’s Guernica is a huge mural on canvas in black, white and grey which was created for the Spanish Pavilion of the Paris World’s Fair in 1937. In Guernica, Picasso used symbolic forms – that are repeatedly found in his works following Guernica – like a dying horse or a weeping woman. Guernica was exhibited at the museum of Modern Art in New York until 1981. It was transferred to the Prado Museum in Madrid/Spain in 1981 and was later moved to the Queen Sofia Center of Art, Madrid in 1992. Picasso had disallowed the return of Guernica to Spain until the end of the rule of Fascism by General Franco.